The overall management structure will endorse already existing links between NoAW partners and build and strengthen new interactions, especially by enabling and fostering the transfer of complementary expertise between the involved research and industry players and countries. The Coordinator of the project is INRA, represented by Prof. Nathalie Gontard. Her primary role is to represent the Consortium to the European Commission, as well as to be the promoter and supervisor of the overall technical and scientific progress. The General Assembly is the decision-making body of the project. Chaired by the project coordinator, it is composed of one representative per partner, each having one vote for decision making. The General Assembly will be responsible for the strategic and political orientation of the Project: overall direction of all activities – research, training and management – and re-orientation whenever necessary, budget revision, incorporation of new contractors, measures towards defaulting partners. 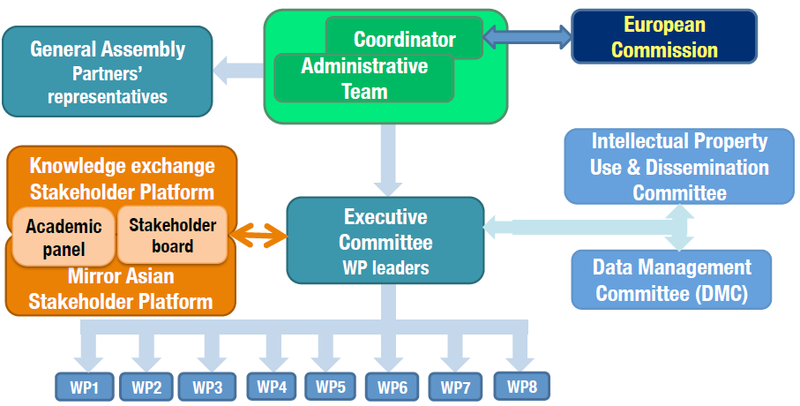 The Executive Committee (ExCom) is the decision-implementing body of the project. It is made up of the leaders of each workpackage and chaired by the coordinator. The ExCom will be in charge of the operational management of all the activities of the Project.